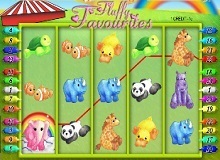 When it comes to everyone’s favourite slot, Fluffy Favorites is the one slot that meets everyone’s needs. Just like a favourite toy, there is a bond that makes it inseparable from the player in ways that are beyond normal reasoning. 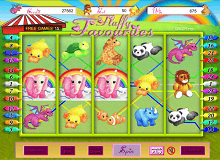 Speaking of toys; Fluffy Favorites casino slot online celebrates the aspect of childhood that involves possession and relives a lot of lost and suppressed memories. There are five reels in the fluffy Favorites free game, and they come with 25 pay lines that you should use to your advantage. The bets are divided into credits with the options 1, 2, 3, 5, 7, 10, 15, and 20 for each pay line. The best part is that you can select any of the paylines that you want using either the lineup or line down buttons. 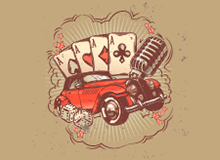 Immediately you have been able to select the lines and the amount you want to stake with, toss the reels into motion and start selecting the combinations to increase your payout and wins. You can set this with the integrated autoplay option or manually. This online casino has some features that would drive you wild. The only wild symbol is a pink elephant, and it is an ‘elephant’ in this casino. It replaces the other symbols except for the Scatter symbol, to form a combination that would add a 2X multiplier to any win accumulated. It has more to offer and would trigger some free spins if it occurs multiple times on an active payline. Three elephants produce 15 free spins, four elephants produce 20 free spins, and five elephants produces 25 free spins. Getting these free spins would produce a wonderful payout that would make the game worth your while. The game reignites the bonds that you once had with your long forgotten childhood toys, especially by just staring at the theme. The Eyecon team did well to produce this slot as nostalgic as the other slots they made that were favorites online. The game showcases an array of toys spread across the five reels of the game. Here the player would find a lion, turtle, gorilla, panda, pink dragon, blue rhino, duck, purple hippo, and some clownfish that would accompany you throughout the journey. There is a colorful display that portrays a delicate rainbow in front of a deep green background. There is also a series of rays from the sun darting through the sky to produce an inviting atmosphere that is full of comfort. The casino is suitable for all players. If one focuses on the gameplay and not the colorful background, you would see that the game as a lot more to offer than just childhood memories. Most people choose their favourite slot based on the generosity of the slot. 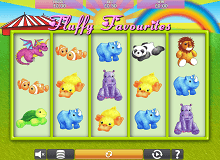 The easier it is to earn real money, the more likely you would want to play Fluffy Favorites slot machine online. Dedicating time to play a slot game is not what matters, but how much profit you make from it. This is why you can play Fluffy Favorites for real money, and it does well to ensure it is among the highest paying slots on the market today. This amazing casino offers you more ways you can win than most other slots and is the major reason it is a favourite today. The toy box feature allows you to increase you RTP if you can accumulate 3 or more claw symbols on the active reels. Once you trigger it, you would receive a free pick that might even result up to 100X the original stake. Another way to win in this sport is the Gamble Bonus, although it is not one of the favourite ways to win. The player can access this feature after any win. After a win, hit the button and you would be directed to another screen. In this screen, there are dark purple curtains with a table that has some down-turned cards. Make a 50:50 selection and stand a chance to double your earnings. Be careful though; you can lose it all. If you strike a winning combination in this game, it means you have done your homework well. If you have fun while doing so, then you are saying that this is the best online slot for you. A lot of video casinos online slots have tried to make their players have fun while making money, but to little or no avail. Eyecon did well to imbibe a capability like no other, fun and profit, into a game to keep you at the edge of your seat. You do not have to worry about the theme, especially if you are a hard gambler. All you need is to try the game out first, and give positive feedback that we already know you would give after trying it out. Summary: We all know that the Fluffy Favoritesgameis a genuine beast behind the cute curtain that showcases fluffiness and love.